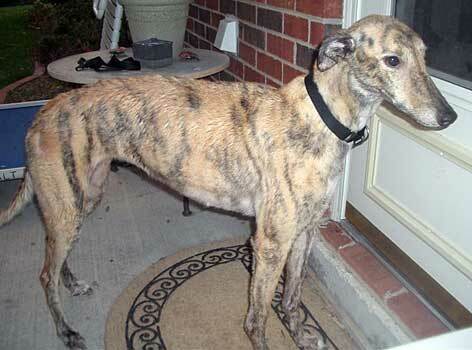 Cami, aka Kiowa Rita Deal, is a beautiful, petite brindle, 4-year-old female, born March 25, 2001. Cami's sire is It's a Lucky Deal, and her dam is Flying Eurorail. Cami was found as a stray in Paris, TX, on Sunday, June 4, by a family who had adopted their first greyhound from GALT just the day before! They were on their way to church, and there she was, just walking down the street! It was apparent that she was not someone's pet by her condition  she was covered with fleas and ticks, with multiple cuts and scratches, and nails that were so long, she could barely walk. 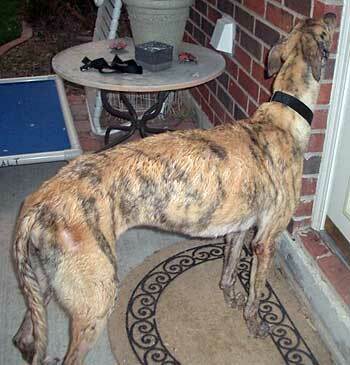 Cami was transferred to GALT later that afternoon and has been in a foster home since then. She is positive to three of the tick diseases: Ehrlichia, Babesia and Rocky Mountain Spotted Fever, and her treatment has begun. It will be at least 8 weeks before she can be retested by Protatek. Cami is cat trainable. Cami is a very sweet, petite girl who has had some hard luck. Shortly after arriving at our home, she dislocated her left front toe. The vet was unable to put the toe back into joint, and recommended putting her under to lessen the pain to align the toe and to give him the opportunity to do a dental, as her teeth were in poor condition. He called in the middle of surgery; Cami had 6 broken teeth on her lower jaw, and he knew this had to be incredibly painful for her, and he recommended removal of all 6. They are not noticeable at all, because they are the 6 incisors between her canines, and usually are covered by her tongue. However, the change in Cami's personality has been dramatic. Her appetite increased, and she's put on weight. She used to be a very quiet girl; now she is very playful. She loves a good romp around the back yard in the cool mornings; she is a beautiful sight to behold! She and my other greyhound play toy-tag; Amber takes a toy out of the dog room into the living room, and Cami takes the toy and puts it back. She wants to be around her people; she loves attention and affection! She makes a very cute little noise when she's happy, a little quick grunt uh-uh-uh-uh... like a greyhound purr; it's adorable. She has completed her course of medication. In a few weeks, she will be retested. Cami finished her first round of treatment and was retested with Protatek. 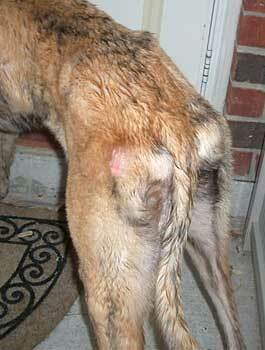 Her titers have not changed at all, so she will receive a second round of treatment. 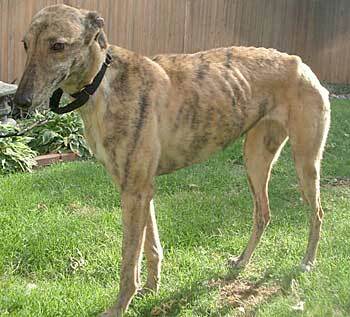 Cami has continued to be treated for her Ehrlichia, which is asymptomatic. She is being adopted by her wonderful foster home, which is familiar with and knowledgeable about the tick-borne diseases. Cami's Ehrlichia will continue to be monitored and treated as is deemed necessary by her new family.